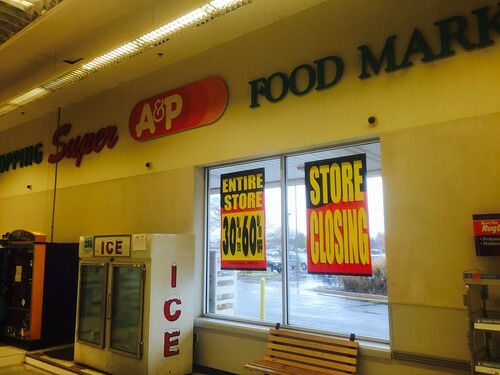 This classic 2000's A&P never received a "Super Food Market" sign... just the A&P logo, oddly. 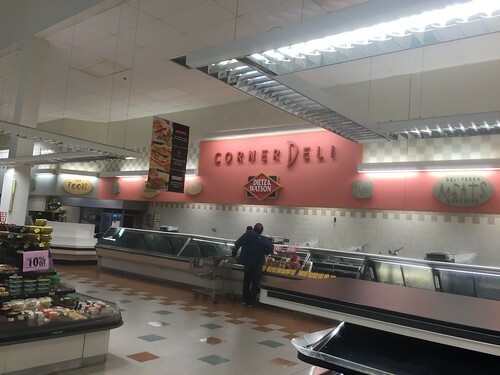 This store closed with the rest of the chain in November 2015, and was never sold. It still sits abandoned today... the entrance is actually rusting. Store still looking very good for being 15+ years old. By this time, we'd usually see the faded pink color instead of the bright, welcoming terra-cotta that A&P originally used. File this one under "Well maintained". 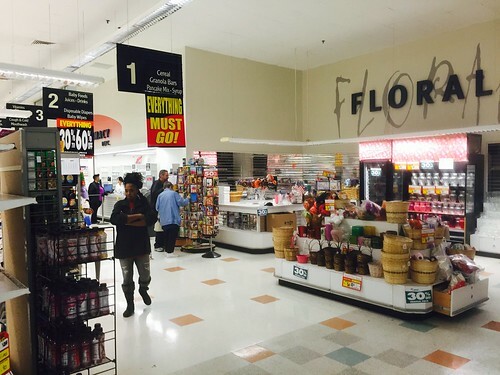 This store had the 2000's pre-Fresh decor, which usually resonates with Waldbaum's. 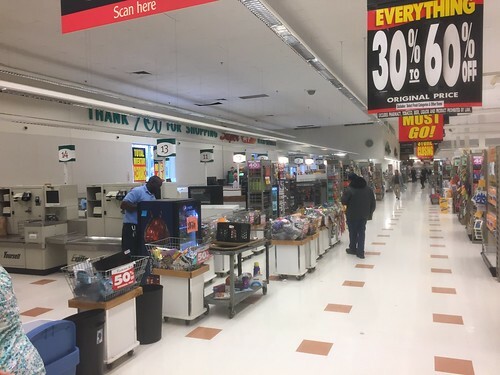 This store tops out at 14 checkouts... most 2000's stores had 17. The actual 2000's floor is intact! Most stores would swap it out, or would never even be placed in the store when built because of how labor-intensive it was to install the different pattern. 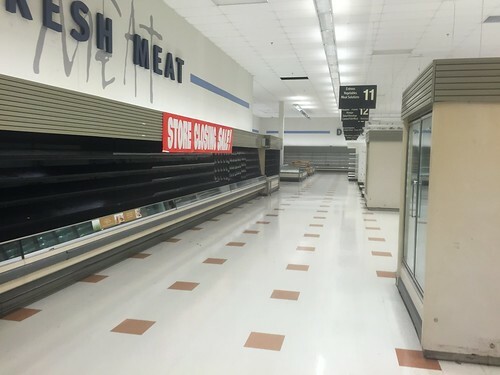 This part of the store (meats) looks a little bit bland... the decor kinda died out here. Corner Deli not at the corner... just out in the wide open. 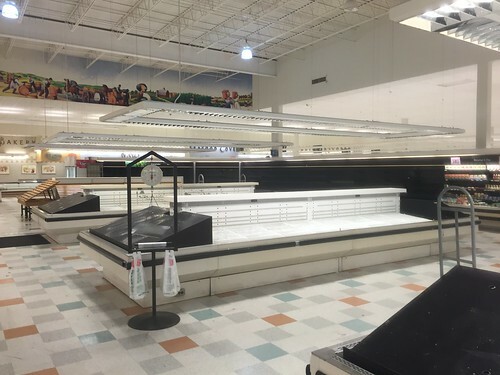 A very empty produce department lines the left side of the store, with the rather standard mural on top. Other stores had more deluxe ones specified to their region. Kitchen Shop in the next aisle as seen by the lightbox... with 30% off America's choice tea and coffee... Thank you! 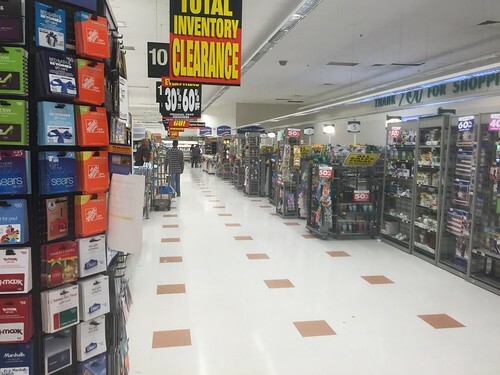 A blocked off section in front of the store here has bargain shelving in front... I wonder what's actually there. 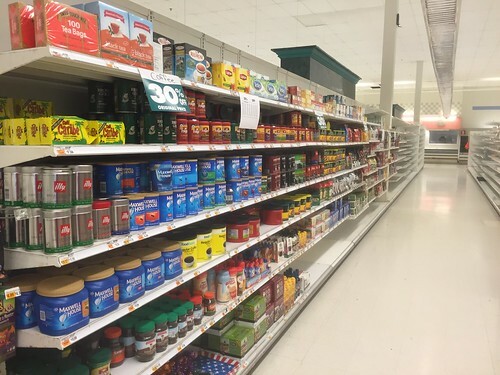 We're going back up the last aisle again for some Fresh Meats. 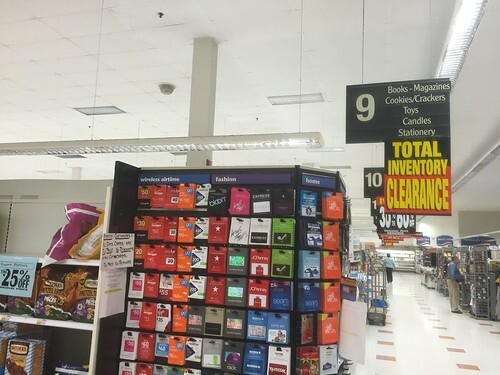 This store had the very basic wood-slat aisle toppers we've all grown to love. 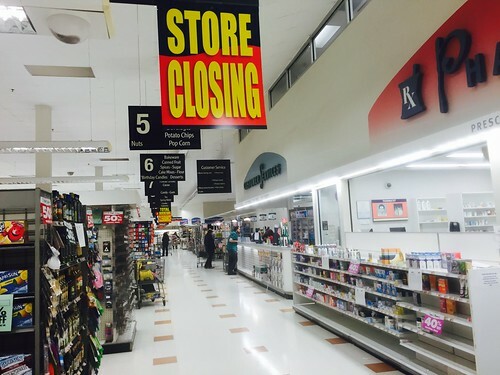 Pharmacy and Customer Services line the front near Aisle 5. Eight O Clock Coffee Cafe still here! Usually these were swapped out for a "Market Cafe", but behold! 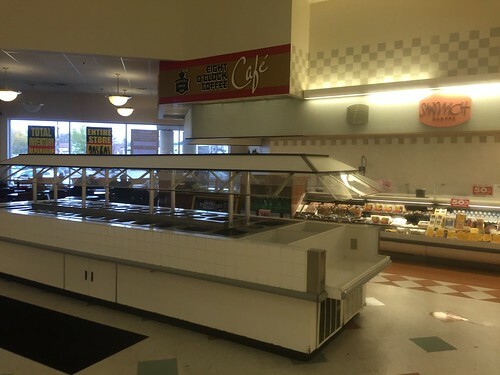 One of the last actual functioning Cafes out there... with an ugly salad bar in front. That blocked off section was a bank branch originally. Forget which one. I had a feeling it was a bank. Most late-1990's A&P stores opened with Chase banks, but most would be under an alcove like Pharmacy and Customer Services. The only A&P with a bank I ever went to was Mount Olive (or Hackettstown, or Budd Lake), it had a North Fork branch. 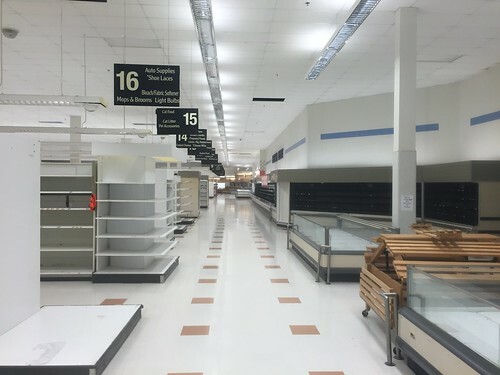 I think it closed around the time Capital One bought North Fork out; from then on it was just blocked off with shelving full of random items. 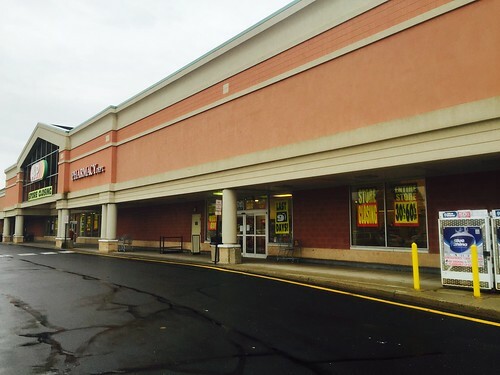 There's also the Blairstown store, which uses their former in-store bank as extra salesfloor space, but I never went there prior to the Acme conversion and I don't know what it would've had. Tim, what a coincidence. I was there recently taking photos... all the lights and fixtures are still inside if you'd like to check it out. Most 2000's Fresh models included a small, 450-sq-ft. Bank or Starbucks area... at the time of the 2015 bankruptcy, there were few left (because of many reasons; contracts expiring, acquisitions [like you said], or just not doing enough business). As far as I know, the last few stores with functioning banks were mainly Pathmarks with BOA's (in PA), and an A&P in Danbury, CT with a Chase. By the awkward position that Blairstown's bank sits in (next to CS) I have a feeling it's a Chase Bank... Pompton Lakes' Fresh store had a similar setup as well. I can't find any pictures online of the store with bank signage, but if I do, I'll be sure to tell you. Before it was a North Fork Bank, it was Trust Company. The East Brunswick #886 store also had a bank in it.